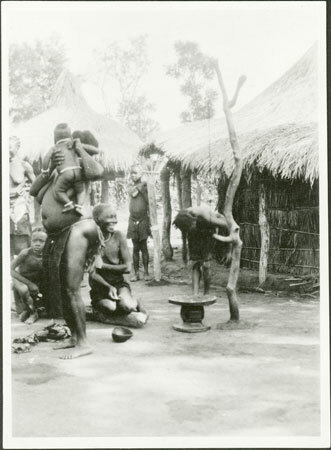 A group of wives and children in the homestead of Prince Rikita (son of Gbudwe), with his tuka or spirit shrine in the background, which contains a pot of ngua or medicines for the protection of the household. A carved Zande stool stands in the foreground. Notes on print/mount - "AII/12 EPA 504 Rikita's Tuka"
Morton, Chris. "Homestead of Zande prince with wives" Southern Sudan Project (in development). 03 Jan. 2006. Pitt Rivers Museum. <http://southernsudan.prm.ox.ac.uk/details/1998.341.504.2/>.